The commander of the Combined Maritime Forces (CMF) counter-piracy task force met with the head of the Royal Navy of Oman in order to build ever closer links between the 30 nation naval partnership and regional maritime powers. 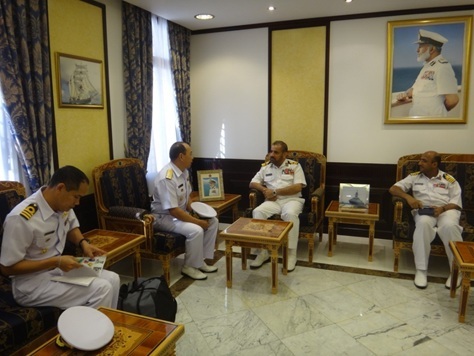 Rear Admiral Pakorn Wanich from the Royal Thai Navy, currently commanding Combined Task Force 151 (CTF-151), met with Rear Admiral Abdullah Bin Kahmis Al-Raisi, Commander of the Royal Navy of Oman, in Muscat to discuss how to enhance the already close cooperation between CTF-151 and the Royal Navy of Oman. Accompanied by Mr Manasawee Tonyoopaiboon, the First Secretary of the Royal Thai Embassy in Oman, and Commander Komol Kongboonrak, a staff officer from CTF-151, Rear Admiral Wanich was welcomed to the Royal Navy of Oman headquarters in Muscat. On arrival, Rear Admiral Wanich expressed his appreciation to Rear Admiral Abdullah for hosting the visit and for the long-standing friendship between CMF and the Royal Navy of Oman. Further, he thanked Rear Admiral Abdullah for always welcoming CMF ships to Omani ports, usually Muscat and Salalah, as they took time out of their counter-piracy patrols to take well-earned rest and recuperation. A key topic of discussion was the enhancement of a joint approach to maritime security in the region. Both senior officers expressed a keen desire to build on their ability to communicate, which is fundamental to strengthening the existing cooperation between CTF-151 and the Royal Navy of Oman.